Everything you need, in ONE convenient place. Beenke is the ultimate shortcut for moms! Save time and money with CashMamas by Beenke. Get online discounts and earn cash back on all your purchases made at over 2,400 participating stores! Find everything you need - from health and relationships, to education, pregnancy, things to do, news updates, parenting advice, and more. Beenke is the one-stop-shop for moms. Build new friendships, share ideas, and ask advice from others who have been there. Beenke's online community brings parents together to inspire, help, and support one another. Motion Sickness Remedies For Kids That Work! My Child Has A Fever: What Do I Do? What Is A 504 School Plan and Should My Child Have One? Dating As A Single Mom: Tips To Make It Work! Why You Need A Parents Date Night NOW! Multitasking Beauty Products For Moms On The Go! Awesome Gifts For Active Moms! Must Have Family Beach Essentials! Meaningful Mother’s Day Gifts She’ll Actually Love! Your Top Ten Weird Pregnancy Symptoms... Explained! Breastfeeding Challenges: Is My Baby Getting Enough Milk? Getting Kids To Listen: It’s Possible, We Swear! Co-Parenting Tips That Work. Even On A Toxic Ex! Simple Self Care Tips To Help You De-stress And Relax! Great Organizing Tips To Declutter Your Life! Practical Parenting Tips For Busy Moms! Brilliant School Hacks Everyone Should Know! Submit your DIY Project to Beenke today. Do you have a favorite "thing to do" with the family? "Must Have" and "Total Waste" products. Ask questions, get advice & support, connect with other moms. It's all happening in our Beenke Community! Save and earn cash back on everyday purchases from your favorite brands and stores. Over 2,400 participating retailers! Parents spend a lot of time and effort helping their kids succeed in school and sports. They also spend time worrying about whether their kids are healthy and happy. But what about teaching your children to care for others? Are you raising kind kids? The sad truth is kindness doesn’t always get as much attention as academics, athletics or artistic achievements, but it should. Kindness doesn’t just happen overnight. It’s something that needs to be nurtured and encouraged. In fact, most young children are naturally inclined to be both cruel and kind. Wait…what? Kids can naturally be cruel? Yes, hear us out. Cruelty stems from anger and frustration. Children don’t have the maturity to manage their negative emotions yet. So when they experience something negative, like another child taking their toy, they can feel powerless and out of control. They lash out as a result. It’s a “you hurt me, so now i’m going to hurt you” kind of deal. In essence, cruelty is a misguided way for a child to try and take their power back, thereby regaining control. While cruelty stems from feelings of anger and loss of control, kindness stems from self-awareness and empathy. 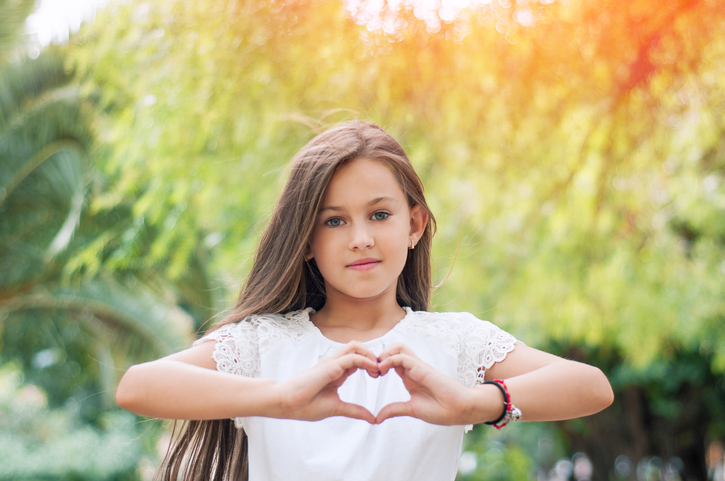 One of the most important concepts to understand when teaching children kindness is that while kids can be both cruel and kind, they cannot be both at the same time. Therefore, if you actively encourage kindness in everyday life, you automatically reduce the amount of cruelty in your child. Imagine it like a sliding scale…as kindness goes up, cruelty and meanness go down. Our brains are wired to try and repeat actions that were rewarding in the past. If your child learns to see kindness as rewarding, they’ll choose the kind response again in the future. It will become their new default. You’d think in today’s world of online cruelty and hate that parents would be more concerned than ever with raising kind kids. But that isn’t necessarily the case. In a Harvard Study, 10,000 kids were asked to rank kindness, personal happiness, and achievement in order of importance. Not only did they rank achievement first, with personal happiness in second, and kindness a distant third – they also said they believed their parents would agree that achievement is number one. Ouch! We may not be spending enough time focused on kindness after all. So if you’re committed to raising kind kids that genuinely care about their fellow human beings, here are 9 parenting tips to put you on the right path. We also include a reading suggestion that compliments each tip to make the lessons easier for kids to understand. Children are born imitators. They mimic the behavior of their role-models. And guess what? When they are little, their biggest role model is you. So if they hear you talking about kindness and see you being kind to others, they will pick up the behavior. Also, keep in mind that for school-aged children the behavior of the dominant kids in class tends to spread like wildfire. Cruel or kind, your kid is going to follow their lead. So in your quest for raising kind kids, don’t forget to partner with your child’s school. Teachers know a lot about what’s happening with your kids’ peers. They can be a great ally. Look for opportunities to practice kindness with your kids. Make it part of your daily routine. It gets them into a mindset of thinking about others, and how they relate to them. Related: Random Acts Of Kindness For Kids – 30 Day Challenge! When you witness your kids being kind, praise them. “I saw what you did for your brother, that was so helpful”. In this way you amplify the neural patterns in their brain that equate kindness with reward so they’re more apt to choose kindness over cruelty in the future. Practice mindfulness exercises with your child. This increases their self-awareness and self-control which, in turn, leads to less reactionary behavior. By encouraging mindfulness you reduce the chance of cruelty being your child’s go-to response. Anger management skills for kids are an important part of the kindness equation. Help your kids learn how to process their anger without being mean. When you hear them lashing out in frustration, point out the real emotion that’s happening. If they say, “I hate you and I’m never playing with you again!” you can respond by saying, “you sound really mad”. In this way you bring awareness to the negative emotion, without rewarding or punishing for it. Your kids will begin to separate being angry from a need to hurt someone else. Empathy is one of the roots of kindness. Which is why teaching empathy to children is critical if you’re raising kind kids. 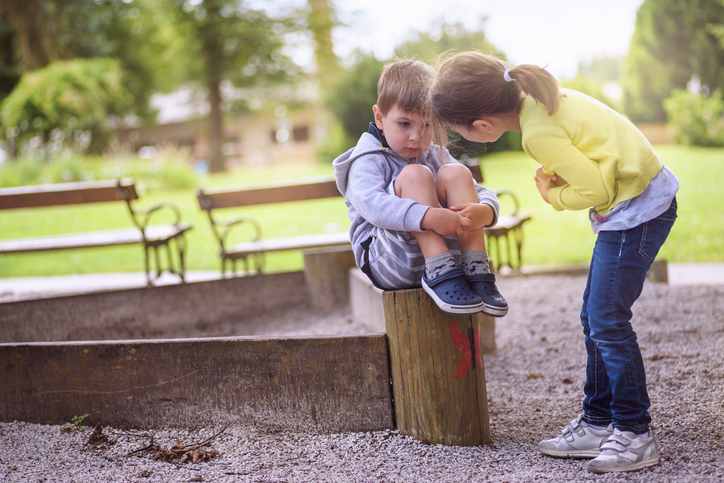 When a mean behavior happens, ask your child to put themselves in the other person’s shoes. “What do you think he/she is feeling?” When kids can imagine the plight of others, it makes them want to help. One of the best things you can do to help kids (and adults) be more kind is to teach them how to give meaningful apologies. A meaningful apology is NOT a simple “I’m sorry”. The apologizer has to acknowledge both what they did that was wrong (mindfulness) and why it was wrong (empathy). When a meaningful apology is given it brings together all the things we’ve been talking about; empathy, self-awareness, and emotional maturity. The apology ends up becoming a kindness to the wronged individual. Instead of screaming from the sidelines to be number one, talk to your kids about teamwork and good sportsmanship. There is nothing inherently wrong with winning, but children need to know that how you play the game matters just as much as the outcome. Research shows that reading kindness stories to kids helps them learn to understand and empathize with different perspectives. Watching television does not have the same empathy building benefits. Maybe one reason TV doesn’t offer the same boost in kindness as books is because it’s chock-full of negativity. Your kids can easily be bombarded with scary news and negative imagery that decreases empathy and increases fear. You want to raise compassionate hopeful kids? Get involved and know what type of media they’re consuming. Be sure they’re exposed to images with a positive and kind spin. Finally, be patient! Kindness is a skill that has to be learned and practiced, just like any other. It takes time and dedication to build a habit. If you keep looking for opportunities to practice kindness in everyday interactions, and praise your kids when they’re being kind, they’ll learn to see kindness as intrinsically rewarding. Before you know it, they’ll be teaching others how to be kind. SHARE this step-by step for raising kind kids on Facebook or Pinterest by clicking the buttons below. How To Use A Reward Chart – The Right Way! We are a participant in the Amazon Services LLC Associates Program, an affiliate advertising program designed to provide a means for us to earn fees by linking to Amazon.com and affiliated sites. Beenke promotes and sells various third party products and services via affiliate marketing links. These change frequently. Presume most links on the site have an affiliate relationship attached, but also understand that if Beenke promotes it, we believe in the product or service. ©2016 Beenke. All Rights Reserved.